Renewed Vision Store - Renewed Vision Support - Which Matrox for Multi-Screen? Quick and easy to install; there's no need to open the computer case or insert components. 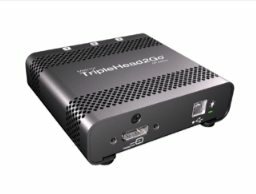 *All monitors powered by TripleHead2Go and DualHead2Go must run at the same resolution. **Available on TripleHead2Go DP Edition only. Which TripleHead2Go or DualHead2Go do you need? The DisplayPort edition features a full-size DisplayPort Input (adaptor cable included for mini-DisplayPort/Thunderbolt). Three full-size DisplayPort outputs (convertible to VGA or DVI with converters which come with Renewed Vision DisplayPort Bundles). This edition uses a full-sized DisplayPort connector for both the input and the output and as such requires an adaptor cable to connect to the Mini-DisplayPort found on current Macintosh machines. Renewed Vision sells this unit as a bundle with the appropriate adaptors. The Digital SE edition features a full size DisplayPort Input (adaptor cable included for mini-DisplayPort/Thunderbolt). The unit has three DVI-D outputs (NOT convertible to VGA). These editions are the ONLY way to get resolutions higher than 800x600 out of each output for a Mini-DisplayPort machine. Powered through USB. Resolutions supported (per screen) include 4:3 and 16:9 aspect ratios: 640x480, 800x480, 800x600, 1024x768, 1280x720, 1280x768, 1280x800, 1280x960, 1280x1024, 1360x768, 1280x1024. NOTE: The maximum resolution, width or height, from all currently shipping Macs is 4096x4096 pixels, which means your maximum capable resolution is 1280x1024 per screen, though this size is NOT recommended for smooth playback. VGA -OR- DVI inputs. Three DVI-I outputs (convertible to VGA with DVI to VGA converters). Powered through USB. Resolutions supported (per screen) include 4:3 and 16:9 aspect ratios: 640x480, 800x480, 800x600, 1024x768, 1280x720, 1280x768, 1280x800, 1280x960, 1280x1024, 1360x768, 1280x1024. NOTE: The maximum resolution, width or height, from all currently shipping Macs is 4096x4096 pixels, which means your maximum capable resolution is 1280x1024 per screen, though this size is NOT recommended for smooth playback. 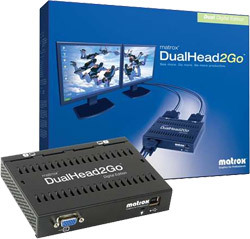 Matrox only officially supports the DisplayPort edition of the TripleHead2Go for use with the mini-DisplayPort . The Digital Edition can also be used as a Dual Head output. 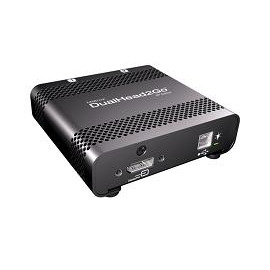 **NOTE: The Mini-DisplayPort is capable of a MAXIMUM resolution for the TripleHead2Go of 2400x600 with a VGA or DVI adaptor to a Digital TripleHead2Go. 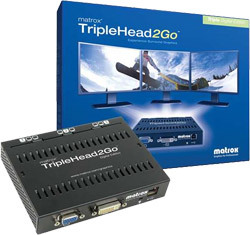 Further, Matrox only officially supports the DisplayPort edition of the TripleHead2Go for use with the mini-DisplayPort. VGA Input; 2 DVI-I Outputs (convertible to VGA); Powered by USB. This is an odd box because it takes a VGA in yet outputs a digital signal out, but may be useful to those that have these kinds of needs. Digital ME Edition: Full-size DisplayPort Input (adaptor cable included for mini-DisplayPort); 2 Full-size DVI-D outputs (NOT convertible to VGA); Powered by USB.